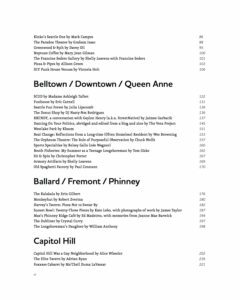 The Ghosts of Seattle Past anthology is less than a week from bookshelves, and you can preorder yours right now! This book is a lovefest, a funeral parade, a passionate and respectful conversation, a cross-section, a tree stump. It coalesces a year and a half of installations, interviews, parties, and public forums. We want to give the city an anchor even as our sense of home remains perpetually in flux. Full-color sections show off some of the gorgeous photo essays and art pieces. Our own Josh Powell hand-drew seven maps spanning the whole city, incorporating pins and stories from the online map that you contributed to. The maps fold around the book like wrapping paper around a present (which it kind of is) or like a guide to treasure (which it also kind of is). This book is going to be a bonanza, folks. We’ve got 82 pieces, from interviews with elderly Black men of the Central District, to cut-paper comix about tattoos that outlive the parlors where they were made, to meditations on how, exactly, anyone could miss a chain restaurant like the Old Spaghetti Factory. 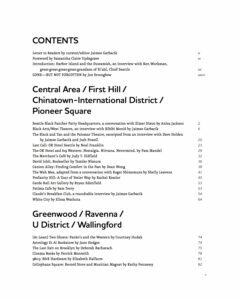 The anthology brings together the voices of poets, activists, fishermen, urban planners, earnest DIYers, jaded punks, hip-hop scene lynchpins, former real estate agents, mourners, hopers, and some people who just their inexpensive taco haven. For something small enough to hold in your hands, the Ghosts of Seattle Past anthology stretches across an awfully big plot of time and space. And today is the day you can preorder your copy! You can join the party by reading the book and also by coming to the actual two-part launch party on April 11. 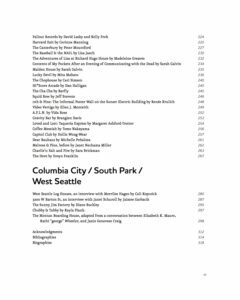 More details on that here: launch part 1 at Elliott Bay Book Company, launch part 2 at the JewelBox Theatre (in the Rendezvous). After the launch, the Ghosts team will be heading out on a cross-country tour, so if you’re outside Seattle, stay tuned for ways to reflect on your own region’s ghosts. It has been a long time since I have been this excited about a newly published book. As a life-time Seattle resident (I have left on occasion but, so far, I’ve always come back), I often find myself mourning all that the city has lost. So much of what contributed to the unique character of the city is being replaced by tall box buildings with no personality at all. I’m hoping this book will ease my mind that all of what Seattle WAS , the charm and uniqueness, won’t be entirely lost forever. Thank you for that!